So, another blog entry for Assam Curry? Sure! Remember my previous Assam Curry Fish? If you can't remember, perhaps, you would like to do the flipping back to the recipe prior to digesting this another Assam Fish Curry? 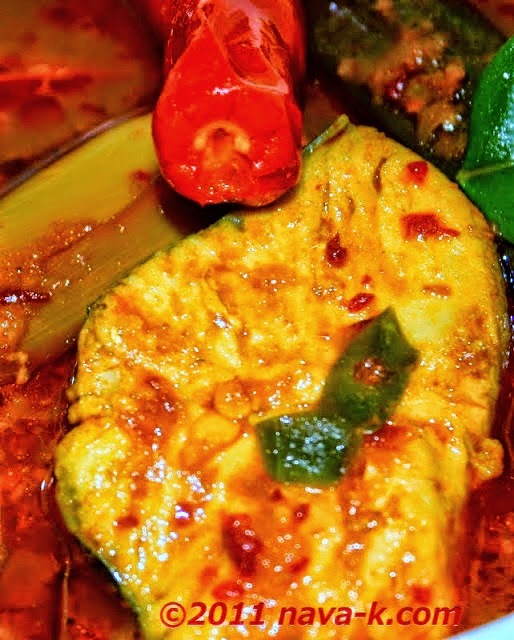 And this Nyonya Assam Fish curry mind you, is a popular take amongst us Malaysians (Nyonya Fish Sambal & Grilled Fish Sambal Stuffed). Assam basically means sourness and don't we Malaysians love sour notes (Kembung Assam Sauce, Chilli Soy Fish, Bengali Yogurt Fish Curry & Penang Assam Laksa)? I do. Honestly, I do. 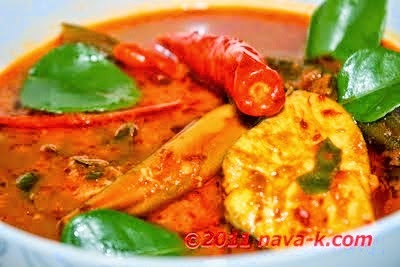 A fusion between Chinese and Malay ingredients, spices and local herbs, Nyonya assam fish curry is just so mind blowing. Terrific bold spicy tastes, aromatic and of course tanginess. Come follow me, let's learn how to make Nyonya Assam Fish Curry (Malaysian Indian Fish Curry, Pompret Soy Sauce & Stingray Spicy Sauce). When oil is heated, fry rempah/curry paste until aromatic and oil splits. Add in ladies fingers, lemon grass and chillies. Give a good stir after which pour in tamarind water. Simmer and boil until ladies fingers are half cooked. When fish is cooked, add lime leaves and stir. Off the heat and curry is done to be served. I bet it's good with chicken and wowza....SPICY! My mum used to cook this dish :)So delicious!! I love assam fish and yours looks so delectable! I love those spices in that dish. Nava, u're tagged in my Play The 7 Links Challenge! because you're one of my fave bloggers :) Check it out! 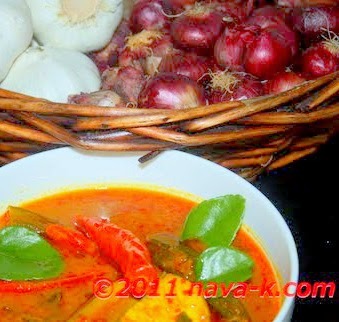 hi nava, i love asam pedas dishes, i simply adore it, especially when some curry powder is added. I love it. I give it a FaceBook like, I save it for my Firday dinner with my best friend. Thanks for the lovely comments to all of you, for sure one of those we love so much at home, your know spicy and tangy are so strong in the type of food we enjoy. Feel free to use any other type of fish you like but must say that the mackerel is prefect for it remains intact and firm after cooking. Why is it called Assam fish curry?